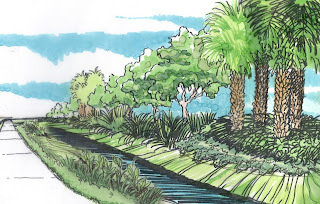 A Greenway, for this discussion, is a 12’ wide minimum pathway utilized for passive recreation (no motorized vehicles) and is typically adjacent to a water body, vegetated/preserved area, and/or urban feature. By the way I was stunned to find so many different variants on the term…Recently, I did some research and found data inferences from two sources: http://www.americantrails.org/resources/adjacent/sumadjacent.html and http://www.greenway.org/benefits.php that speak to a positive, in some cases astounding, positive impact on surrounding Property Values and the Overall Economy. The first link deals with refuting the popular Public perception that Crime will infest the area if a new Trail system is constructed (thus the reason for the Study); however, the authors found no increase in ‘THE crime,’ meaning muggings, break-ins, and serious offenses that certainly make most people want to attain a firearm or slap iron bars on every window – scary stuff. Most of the crimes that occurred were minor in nature, either someone trying to avoid the road with their scooter (perhaps too many cars were in the way!?) or kids were being, well, kids…This whole point is counterintuitive – if more people have the ability to enjoy morning or evening walks, aren’t more ‘eyes’ on the Trail in the first place? Certainly a thief would enjoy a dark, desolate spot, in which to have time, make noise, and otherwise, remain unseen while committing a crime. Lighting is certainly an option, with minimums established in height, volume, and evenness, enough to facilitate a Police Officer or Resident to see some shenanigans occurring. Light trespass can be an enormous bone of contention, with visions being painted of shut-tight blinds and intense light piercing the room (similar to the scene in “Close Encounters of the Third Kind”). However, if light is directed downward and is designed with a full cut-off, this should not present a problem – the lighting designer then figures out the maximum height and spacing to establish a coverage – and ‘ambiance lighting’ could be the result. Efficient Lighting, even though it does consume energy, can facilitate ‘extended hours’ to a Greenway – offering even more of a ‘bank’ in traffic counts…in my mind, this is a valid offset. How would a Greenway affect your quality of life? Transit. How would you answer if they proposed it in your backyard?